Our passage in verse 10 is a summary of the pattern of behavior that the children of Israel followed, more or less, going forward until the Babylonian captivity. It is quite pronounced during the early time of the Judges, but gets less predictable as time goes on. The trajectory of their expression of religion was steadily away from God. There were seasons when God’s glory was manifest, and then came along another generation that did not know the Lord or the works He had done in Israel. This was usually expressed in the personality of the king that was over the people. In other words, the king was a microcosm of the heart of the people. It could generally be thought true that if you knew who the king was you knew who the people were (godly or ungodly). It seemed as though this generation in Judges 2 waited for the former generation to pass away so they could finally cast off the duties of the covenant that their fathers had made with the Lord. It should have come as no surprise, but God had already warned Joshua and the people earlier in Judges 2 that their sinful compromise would result in the gods of the land becoming a snare unto them. Specifically, they broke the commandment to enter into no alliance with the inhabitants of that land, viz., the Canaanites (see Exodus 23:32-33; Exodus 34:12-13, Exodus 34:15-16; Deut. 7:2.; Joshua 23:12). In Judges 2:2 the LORD reminded them that they did not “destroy their altars:” taken verbatim from the command in Exodus 34:13 and Deut. 7:5. The words “and ye have not hearkened to my voice” in the same verse calls to mind Exodus 19:5. “Why have you done this” (מָה־זֹּאת, literally “what is this that ye have done” see K.D.) is a question pointing to the sparing of the Canaanites and the tolerating of their altars. For this reason God said he would not drive their enemies out from before them. The people wept, but it was too late to weep. (Judges 2:4) This is a great picture for us to consider and it is written for our admonition and learning upon whom the end of the age has come (1 Corinthians 10:1-11). The new generation that “knew not the Lord nor the works that He had done in Israel” had obviously missed out on a few vital steps that the previous generation had experienced. First, Joshua’s generation witnessed the plagues of Egypt and the destruction of Pharaoh and his army by the Red Rea. None but Joshua and Caleb survived to cross over forty years later. The children of that generation watched God bring judgment on their parents in the Wilderness until every one of them had died. It took forty years to lay to rest this generation, hundreds of thousands if not millions of people. If we do the math it would mean that for 1 million people there would have been over sixty eight funerals a day, seven days a week. This generation saw the manna from heaven and the water from the rock. They were familiar with the fire and the cloud that led the children around in the wilderness of Zin. This generation witnessed the giving of the covenant and knew what the commandments were. They waited for their opportunity to pass over to the promised land. But for all their experiences, they lacked two vital things. It may come as a surprise, but the generation that came up in the wilderness had not been circumcised on the eighth day according to the command of God in Lev. 12:3. In fact, they had not been circumcised at all. Joshua had to take on the project of circumcising all the people before they could cross over into the land (Joshua 5:5). To understand the severity of this sin, one only need look at the incident in Exodus 4:24-26 where God would have slain Moses over not circumcising his youngest son. This helps give a flavor of the level of rebellion the people that died in the wilderness were moving in. They didn’t obey God. they passed through the Red Sea and were baptized unto Moses, but they were content to allow him to do all the religious exercise. God only intended for Moses to the the leader of the people, not a representation of the people themselves. They needed to serve God in their own personal lives and in the lives of their families. They refused, insomuch that they didn’t even circumcise their sons on the eighth day as commanded. They passed through the Red sea, but they never passed through their own personal death. It is common sense to know that you can’t resurrect the living, you can only resurrect the dead. They were alive to themselves and dead towards God for forty years. They died, but they never died to all that they needed to. No death= no resurrection. You will notice the phrase in the Old Testament It is impossible to overstate the importance of passing through death. We might call it a “Jordon experience”. 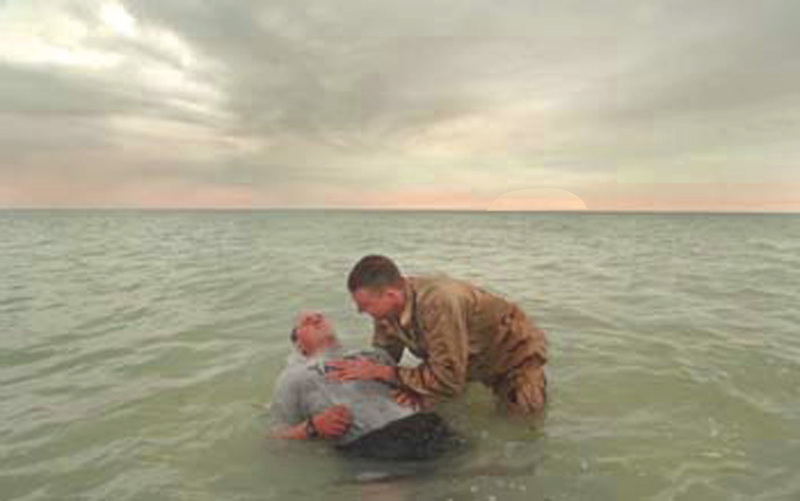 When God got ready to preach the Gospel it began with repentance and baptism in the Jordan. This is an expressive picture of death to our own life and will; to be quickened to God and His will. Death in scripture often denotes separation, not annihilation. They had to come to an end in death to themselves to be resurrected new in Christ. Some want to stay on “this side of Jordon”, but God tells us that those who do such things their sins will find them out. (Numbers 32) The results? God is not pleased and overthrows those who take such an approach. Why did another generation that “knew not the Lord” come about in Israel? Certainly it is because that generation had never passed through the river in the same sense that their parents and ancestors had. They had never had a real experience in God where they could say “the old passed away and all became new”. They kept on being who they always were and tried to add a little religion to the bit. It will never do. We all must pass through death. God even gave instruction on how to make sure this was always performed and never forgotten. When a generation comes along that has not been through this process they become no different than the people that God cast out of the land to begin with. It is important to know that it takes more than a heritage to save us. We have to have the real experience for ourselves. Here the ESV corrects the KJV that renders the text “believes not”. “That obeyeth not” (ho apeithōn) could be translated, “He that is disobedient to the Son.” Jesus is the test of human life as Simeon said he would be (Luke 2:34.). This verb does not occur again in John’s Gospel. (A.T. Robertson) Disbelief is regarded in its active manifestation, disobedience. The verb πείθω means to persuade, to cause belief, to induce one to do something by persuading, and so runs into the meaning of to obey, properly as the result of persuasion (compare 1Peter 4:17; Romans 2:8; Romans 11:30, Romans 11:31). Obedience, however, includes faith. Compare Romans 1:5, “the obedience of faith”. (Vincent) Notice that they will not see life, but the wrath of God abides or remains on him. The children of Israel are an example to the churches of God and to Christians around the world. The stories of their lives are written for our example and learning. Some generations served the Lord and others rose up that knew not the Lord and served the gods of the land. It is no different today. People try to come to Christ and without the cross being applied to them and they end up living under the wrath of God. Faith implies obedience. It suggests persuasion that what is said is true. Jesus gave a lot of warnings and the people had to decide. “Almost persuadest thou me” is not enough. We have to be persuaded into obedience. This is the test as to whether or not our faith is genuine. If we pass it we presently have eternal life, if we do not we presently have eternal wrath.